This is a TIGSource Main Event Free Form Competition. What is Main Event? Main Events are a week or two longer than TIGER Assaults. The goal is still the same: use all your available resources to focus on completing a game within the time limit. But consider using the extra time you have available to plan your game properly, beta test, and eventually put out a pretty polished product. There are still no prizes involved. What is Free Form? Any format goes! But the game should at least run on Win32 platforms. The theme of the game is BOOTLEG DEMAKES. The term "demake" was most likely coined by one Phil Fish, to describe a remake of a game on older-generation hardware (or, more likely, a remake that is made to look as though it were running on older-generation hardware). The most obvious demake is, of course, the 3d-to-2d demake. 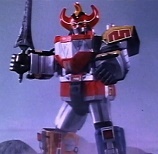 The term "bootleg" generally means "unauthorized or unlicensed copy." For this competition it means that you cannot use any trademarked names or ripped materials. Everything must be 100% your own (although obviously inspired). Think "Cogs of Conflict," "Master Chef," "Great Giana Sisters," etc. It is your decision how far to take the bootlegging, but under no circumstances can you violate someone's intellectual property. Your mission, should you choose to accept it, is to create a bootleg demake, preferably one that adds/changes game mechanics in a significant way or reveals something interesting about the game (or games!) being demaked... or does something else that's like "whoa!" I'm sure you guys will come up with some surprises! Use the extra time available to you! - Entries must NOT contain any trademarked names, images, or sounds, or any kind of copyrighted material. - It is OKAY to demake a part of a game, as opposed to an entire game. - It is OKAY to demake a series, or to put multiple games into a single demake. It would be interesting to tackle a franchise or movie setting rather than a game. Like, you're pretending to do an unauthorized E.T. game for the Atari 2600, before the official game comes out. Would make an interesting competition I think. 'Unauthorized movie game done in the mid 80's'. Then you'll have to be creative and show that movie games can be great and represent the soul of the movie, even with 'primitive' graphics. It doesn't take long before total immersion kicks in, regardless of gfx, if the game is well made. I could imagine that it's possible to do an Alien game which is very scary. There was one for the C64 but I never played it. - Using pre-existing game engines is OKAY. - Submit your game by declaring "FINISHED" on your game's thread, or by PMing or e-mailing me. Include the download link to the latest version of the game somewhere where I can find it. Better start trying to mak sumfin. You know what? 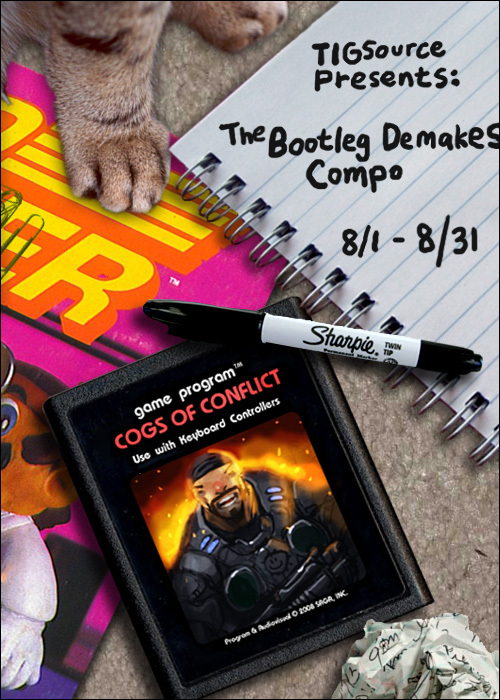 I think I might actually go ahead and attempt a Cogs of Conflict. Seems like a good idea. Bring on the Cave Story ripoffs! I'm hoping to submit something to this. No idea what to do yet, though. I'll try my darndest to submit something to this compo. It won't win but to submit something is enough for me! Ditto. I'm going to try and think of the simplest idea I can, something I'll be able to get done in an evening, before touching a line of code. I doubt I have any time for this, so I'm not starting a thread or anything. Just wanted to say good luck to everyone, because I am really really looking forward to it. So much potential in this one. Someone needs to demake bionic commando rearmed on the NES so that it can come full circle. By the way, does it NEED to be based on hardware standards of the time? Or can it just be like "boiled down" mechanics and simple, rather than hardware limited graphics? and... what is Arne's idea? Since the Tokio Wonder Nights is on the same deadline... do you think we could push this compo just a few days, so it increases the chances of me entering this contest? I'm hoping to be able to give this one a try. I'll actually have a couple weeks of free time, so I may be able to get something made. + a graphics guy with a strenght on (stylish) NES/SNES-like Pixel-graphics. Wow. Amazing work. All of you. I'm no programmer (yet), but I have the perfect idea for this. I'll have my thread up in a few days. Gad, I want this so bad. Consider me entered. WOWWEEWOWWOW!